"Surrounded by evergreens, and reflecting its hallowed ruins in the river Tay, this ancient Cathedral reposes in the deep bosom of wood and mountain. The Choir, originally built by Bishop Sinclair in 1350, having fallen into a dilapidated state, was renovated in 1820 by the Duke of Athole, and is now used as the Parish Church. Its other parts are unroofed and ruinous, yet in tolerable preservation. 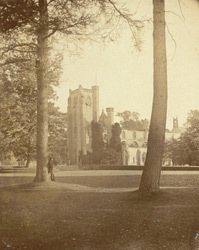 The tower, begun to be built by Bishop Lauder in 1469, and finished by Bishop Brown in 1501, is one of its principal features, measuring 24 feet in width and 99 in height. The early history of this Cathedral is to a great extent obscure, but it is generally believed to have been an establishment of the Culdees in connection with St. Columba and St. Cuthbert. In a vault below the Chapter-house is the burial-place of the Duke of Athole, and in the porch is shown an effigy clad in armour - 'The Wolf of Badenoch.'"